Dreaming about having romantic waves every day? It's possible with a professional curling iron and a few useful tips from our side. Take a look at our in-depth analysis of the most demanded curling irons for sale and choose your path to perfection. A professional set of hairdresser’s tool is now available for home use. 5 interchangeable barrels of different shape and size create all possible curls and waves with minimum efforts. The super high-tech ceramic wand, infused with a real pearl, provides smoother glide. The precious power of pearl will make your curls sleek and strong. This curling iron is great for both, home and professional use. It's got a long, swiveling cord for enhanced manoeuvrability. Due to even heat-up from all directions, the hair holds the curls perfectly. 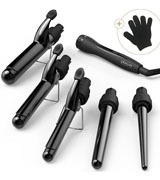 Features several heating settings for creating curls of different sizes and shapes. A low-consumption tapered curling iron for creating a variety of curls on any length and type of hair. A unit won’t tell you by any sign or beep that it’s already been cooled down. It is a clamp-free model, though a heat protective glove improves the situation. A light indicator is rather dim. Might be not the best tool for users with long hair. Though the iron has got a ceramic barrel, you still may want to use some protective spray on the hair. Maximum versatility and styling possibilities are guaranteed with a professional set from XTAVA. Chart off in terms of functionality and price. Remington CI9538 will surely deliver salon-quality results with a luminous luster. You can also choose a 1/2 - 1-inch option for longer hair. A perfect curling iron for all hair types. The Pusle Technology ensures fast heat-up and high protection of hair . This is surely a great styling device for people with hair of average lenth, allowing to create tight, loose and mid-sized curls with ease. 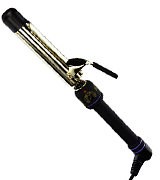 Easily the most durable and efficient curling iron with a lifetime warranty, available at an extremely low price. And the last, but not the least criterion to pay attention to is Safety of Use. When choosing an iron, it’s worth considering how long is the cord. Ideally, it’s got to be at least 2 m long and it’s got to swivel so that you don’t get tangled while making a hairstyle. If you’d like to purchase a conical iron, pay attention whether the model comes packed with a heat-resistant glove. We’d recommend you to give preference to a curling iron with an auto shut-off function. Such irons usually work for about 72 minutes right along and automatically turn themselves off, so that you’ve got a total piece of mind no matter what. Ceramic coating of the barrels is what’s required for the natural shine of faded hair. Whatever you’ve seen on pages of glossy magazines with owners of luxurious hair, today can be done at home and at an affordable cost. You think you need to spend a fortune to achieve the same results? Not really. XTAVA professional hair curler is covered with the smooth ceramic coating that removes electrified effect and ensures glossy and tight locks of top models. XTAVA Professional hair curler features 5 interchangeable barrels of a different shape and size and creates all types of curls in a flash of a moment. From beachy curls to romantic waves, all is possible with this curler. A range of temperatures varies between 270-410 degrees Fahrenheit, so you can direct the desired level of heat on the hair and achieve different results. Tight ringlets are usually achieved at a bit higher temperature and longer exposure time while soft and romantic waves occur as a result of shorter operation under the heat. XTAVA Professional curling iron also features an auto shut-off function that will give you a rest of mind whenever it’s being left over on. The ceramic tourmaline coating of the barrels won’t damage a hair and ensure smooth and shining results, even if you’d like to use it every day. The negative ions emitted by tourmaline remove the frizz and keep the hairstyle perfectly done even in moisture. A heat regulator will let you set the desired heat so that your hair always remains safe and healthy. 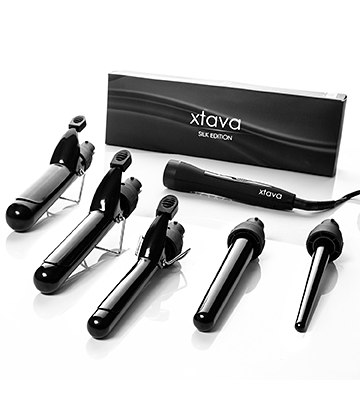 XTAVA Professional curler is also safe to take around (what if your friend asked you to help with the curls?). The unit is packed with a heat-resistant safe bag for easy and comfortable traveling. The conical shape of Remington CI9538 will help you create silky curls with a luminous luster. This professional tool lets you do any professional hairstyle you want. For example, it can create smaller curls at the ends of your hair and bigger curls closer to the roots. In such a way, your hair will have an extremely natural look. We would like to stress that this curling wand has no clamp. Due to such innovation, you will get perfectly smooth curls and waves. Just wrap and go! Curling Remington CI9538 heats up in a matter of seconds; it is ready to go in just 30 seconds. What's more, you have an opportunity to adjust the heating temperature using an easy-to-read digital display. The temperature range varies within 270-410 F. So you can choose the best option for heating thin or thick unruly hair. A special LCD lock keeps the set temperature and prevents accidental dropping of settings during use. If you ever forget to switch the Remington CI9538 off, don't worry! Owing to a shut-off function, this magic wand will automatically switch off after 60 minutes of being not in use. For the extra safety, the Pearl Styling Wand is equipped with a cool tip and a styling heat-resistant glove to protect your fingers from burns. As for your hair, you can be sure that it is also 100% protected as a unique pearl ceramic coating provides the maximum gentle curling. 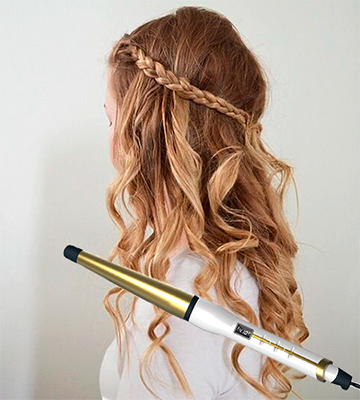 All in all, this styling wand will become a reliable assistant to help you create fashionable hairstyles every day. 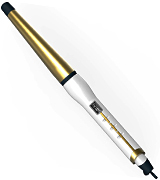 Hot Tools Professional 1110 Curling Iron is a modern, advanced styling tool at a moderate price that will work for all hair types. It's got a conical shape, giving the hair more volume at the roots and loose curls at the ends. Those girls who prefer natural locks to the tight ringlets will be impatient to try it the moment it's arrived. Owing to the smart, modern design, it's also very convenient to use. The styling tool has got a gold-plated barrel a long cool tip, so it's safe to hold the handle even when it's set on the maximum heat. With 85 watts of power, Hot Tools Professional 1110 Curling iron heats up really quick and reaches high temperatures in a short time. The device maintains the even heat along the entire length so that all your curls are perfectly shaped and hold the curl for longer. The rheostat of a curler is capable of memorizing the frequently set temperatures, so when you switch a tool on the next time, it's already set at the heat setting you need. Alas this curling iron has no digital screen to track the heat setting, yet it doesn't affect its safety at all. Paired with a long 8 ft cord, it's absolutely safe to swivel it around and create a hairstyle. You'll hardly ever need to use protective gloves. The curling iron has a long cool tip and a soft-grip handle for comfortable, safe usage. This is another curling iron that creates perfect curls in a chamber. The drawn hair in the chamber is evenly, gently heated from all the directions to create the curls of different sizes and shapes. On using Conair Infiniti Pro Curl Secret, you’ll never run a risk of damaging hair. Timing is always perfect. Whenever the curl is done, you’ll be alerted with a beep sound so that you can open up the chamber and draw a new lock in. The chamber is coated with tourmaline ceramic, owing to which your hair will also acquire beautiful, healthy gloss. If you look for a professional styling tool, Conair curler can be a great option! Notwithstanding a fancy design, Conair curler is rather easy to use. When you see the red light blinking, the device is heated up and ready to curl. The chamber has got a V-shape mould to place the hair in the right position and create a curl of a perfect shape. Due to 3 timer settings, it’s easy to do different hairstyles every day. Loose, tight and medium curls are achieved for different occasions! Conair Infiniti Pro Curl Secret is one of the biggest hairdressers’ secrets that have been revealed! Before you start to make a hairstyle, make sure that your hair is not wet and well combed. That would prevent it from tangling. Rather than that, using it is a snap. The picture of the curler may somewhat confuse you about its size. It’s not bulky though and comfortably fits any palm. Conair curler offers a sleep mode to save you power and shuts itself off after 60 minutes when not being used. If you’re seeking for a styling tool to create different looks, it surely will work for you. It’s suitable for all hair types, and it’s great for multiple hairstyles. Beauty requires sacrifice, but not when it comes to hair. The weak and faded locks won’t make anyone look beautiful. This is where ceramic coated Perfectwo curling iron has got no equals. The wand with evenly distributed heat won’t ruin the hair and will smoothly slide over the entire length. 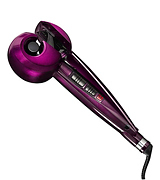 Upon using this professional tool, you’ll get a beautiful and glossy hairstyle with a curl to curl, neatly coming down. What will surely make you like Perfectwo curling wand is the PTC heater, a heating element that doesn’t consume a lot of electricity and yet, quickly heats up. Usually, ceramic curlers yield to titanium devices in the heating rate, but not with such heater. It heats up pretty quick and becomes really hot, so, make sure to set up the right temperature for careful use. For your comfort of use, the curler has got a small digital screen where you can control and regulate the heat. There are many things that we like about Perfectwo curling iron. And one of them is its long cord that swivel and easily rotate in a full circle without getting tangled. The length of the cord allows ladies to do the curls right in front of the mirror without being tethered to a power outlet. Perfectwo hair curler also features a shut-off function that automatically turns the unit off after it’s been out of use for about 60 minutes, which is an irreplaceable feature in terms of safety and comfort of use. But the best thing that we like about Perfectwo model is that it comes with a lifetime warranty and can be used literally to the rest of your days. It is a funny comparison, but there is a deal of truth in it.